In our work on Pioneer Girl: The Annotated Autobiography, we found an interesting series of documents illuminating Mary Ingalls’s path to the Iowa College for the Blind. When Mary suffered the illness that led to her blindness in the spring of 1879, she was fourteen years old. Her education prior to that time had been inconsistent, interrupted by her family’s various moves across the country. More dramatically, she had no training in how to function as an adult without vision, making her totally dependent on others for most of her basic needs. Compounding the situation, her father, Charles Ingalls, had just taken a job on the remote Dakota Territory frontier. What would become of Mary far from doctors and specialized schools? Charles Ingalls was a resourceful man, and he soon found helpful colleagues in the new town of De Smet. One, attorney Visscher V. Barnes, mentioned frequently in Pioneer Girl, set to work to find resources for Mary Ingalls. In a series of letters to George Hand, the secretary of Dakota Territory, in the summer and fall of 1881, Barnes described Mary as “a young and intelligent lady,” who “ought to be provided for in some way.” Barnes outlined the situation—“her parents are unable to make much provision for either her treatment or mental culture”—and he inquired about any territorial laws that might apply (Barnes to Hand, Aug. 29, 1881). Hand apparently responded that the territorial council had passed relevant legislation in 1879 that authorized the governor of the territory to enter into a contract for five years at a time with an institution in one of the surrounding states of Iowa, Minnesota, or Nebraska to provide education for a blind resident, “keeping in view economy” as well as the welfare of the student. A letter in the Rose Wilder Lane Papers at the Herbert Hoover Presidential Library indicates that in 1881 the Iowa College for the Blind in Vinton charged $216 per out-of-state student per year. The student had to provide transportation to and from Vinton and his or her own clothing, and in some cases, students were unable to do even that (Robert Carothers to Wm. C. Cort, Dec. 21, 1881). Once the Iowa College for the Blind accepted the contract with the territorial governor to educate its blind students between the ages of five and twenty-one, the school became for all intents and purposes “the institution of the blind of [Dakota Territory]” (D.T., Compiled Laws, 1887, sec. 272). Amos Whiting, the Kingsbury County superintendent of schools, began the necessary paperwork to certify that Mary Ingalls, age sixteen, was “blind and unable to obtain an education in the common schools” and was therefore “entitled to the benefit of the Institution for the Blind of Dakota for the term of five years, she not having passed any time in a like institution” (Whiting, certification, Oct. 3, 1881). For his part, Visscher Barnes continued to push for additional support, asking if there were any way for the territory to provide for transportation for her and her parents, as well. “The young lady has been blind only a short time,” he wrote in October, “and not long enough to learn to help herself. She is, in fact, at present left almost helpless, and it will be necessary for her parents to attend her” (Barnes to Hand, Oct. 7, 1881). The records do not show whether or not the plea for additional support was successful, but on October 15, 1881, Dakota territorial governor Nehemiah G. Ordway approved Mary A. Ingalls’s certification of eligibility for five years of schooling (presumably through age twenty-one). 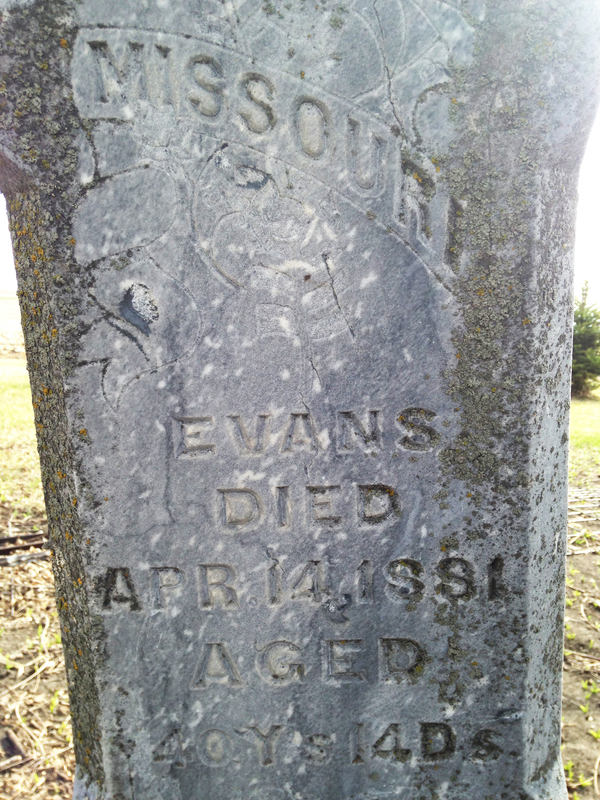 She carried a copy of the signed document with her to Vinton when she entered a month later on November 23, 1881. The need to raise funds for transportation may have caused the lag in time. In These Happy Golden Years, Wilder vividly recorded the difference the education made in Mary’s circumstances. During Mary’s first visit home about two years later, a trip that she accomplished on the train by herself, Mary “moved easily around the house,” Wilder wrote, “instead of sitting quiet in her chair.” She was “gay and confident,” and when Pa brought in her trunk, “she went to it, knelt down and unlocked and opened it quite as if she saw it” (pp. 124–26). In Pioneer Girl, Wilder noted that Mary had “pleasant college memories to dwell upon” and was “able to sew and knit and make beadwork, to read her raised-print books and to play the organ that Pa and I together had bought for her as a surprise” (p. 295). Mary Ingalls would actually attend the Iowa school for a total of seven years from 1881 through 1889, two more than the five she was originally eligible to receive. In 1885, the territorial council had amended the law to read that each blind student was entitled to a total of eight years of schooling. When Dakota Territory became the two states of North and South Dakota in November 1889, however, the state of South Dakota took a different approach to the education of its blind citizens, putting the burden for payment on individuals or individual localities. When Mary Ingalls sought to return to the Iowa College for the Blind in 1892, she was informed that it “would be impossible” because the state of South Dakota had “appropriated no money for the education of the blind” (Mrs. Robert Carothers to Mary Ingalls, Dec. 7, 1892, RWL Papers). 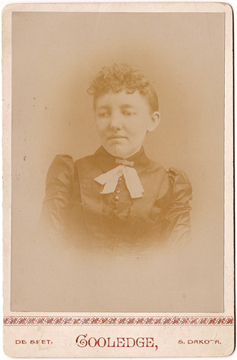 The state would not establish a school for the blind until 1900; by that time, Mary Ingalls was thirty-five years old. USA Today contacted the South Dakota State Historical Society last week to discuss an article that was soon to appear in Pediatrics about Mary Ingalls’s blindness (read USA Today’s coverage here). An assistant professor of pediatrics at the University of Michigan speculates that the illness that caused Mary Ingalls’s blindness was probably viral meningoencephalitis—a big term that was not likely to find its way into Laura Ingalls Wilder’s books or her autobiography. In her fictional retelling of this episode in her sister’s life, which appears in the opening pages of By the Shores of Silver Lake, Laura Ingalls Wilder ascribed the condition to a bout of scarlet fever, one of the most deadly childhood illnesses of the nineteenth century. Pamela Smith Hill, Wilder biographer, suggests, “Wilder probably chose scarlet fever for the fictional version because it was such a deadly disease and because after arguing with Rose about whether to include Mary’s blindness in the Little House books at all, it was a swift, clear, and believable alternative.” For the age group she was writing for, scarlet fever was understandable; viral meningoencephalitis is a term best understood by medical researchers and doctors.